Plan ahead and get yourself a cheap Antigua flight for a perfect Caribbean vacation with beaches and sun and all you can imagine in December 2014. Book now and fly from Boston to Antigua with United Airlines from $348 r/t, including taxes – $352 cheapest than the next best offer we found. Our deal hunters have found this Faregeek deal while searching on Travelgrove. If you want to book this Antigua flight you should search in the box, but not only Travelgrove, the other merchants as well, because, who knows, they might have an even better deal. Fly from Dallas/ For Worth International Airport (DFW) to V. C. Bird International Airport (JNB) on December 6 and return on December 10 this year. The flight is super cheap, the only issue is that it has a 14 hours 38 minutes stop in Newark on the way to Antigua and an 11 hours 28 minutes one on the way back. Booking this Dallas to Antigua flight will bring you 6,310 award miles from the airline, about 10% of your next free flight from the US to Europe. Almost incredibly, this United Airlines flight costs only half of the price of the next cheapest ticket. 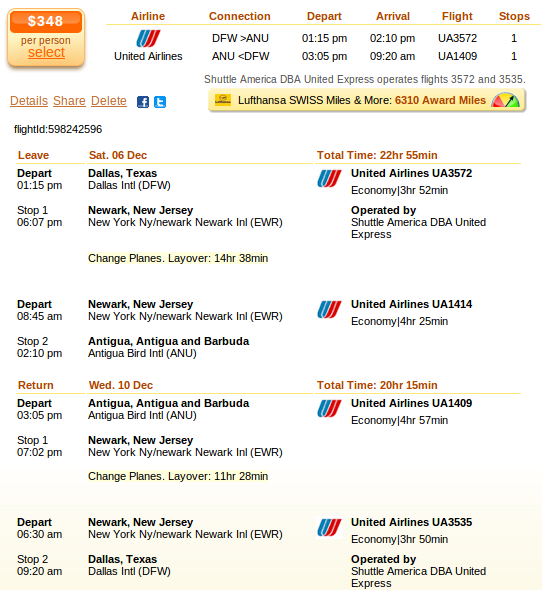 The United airfare costs $348 r/t, while the next best offer – from American Airlines – is $700 r/t. Test the rates in the above box, but hurry, such a cheap fare will sell out very quickly! This entry was posted on Thursday, May 8th, 2014 at 9:30 am and is filed under Airfare Deals. You can follow any responses to this entry through the RSS 2.0 feed. You can leave a response, or trackback from your own site.